Make a statement in your home, without saying a word. Your fireplace mantle is the first thing a person will see when they enter your room. Stone fireplaces sophisticate any home’s style. Using stone features draws attention even with traditional decor. It is difficult for a fireplace not to capture attention. Add a stone finish, and it is likely to become the focal point of the room. Eight out of ten of homebuyers look for homes with a fireplace in homes and consider this as being the most appealing amenity for the home. 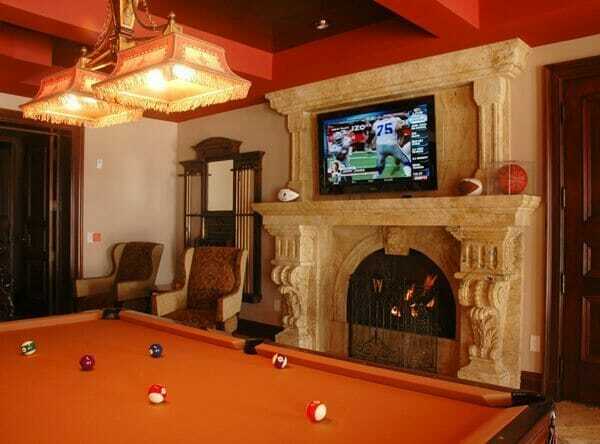 Purchasing a home with a fireplace or adding one on to your home can provide tremendous benefit in home resale value. In fact, one of the top investments you can do to your home is to add a fireplace. Fireplaces are available in various styles. So, how do you create a fireplace that serves as a focal point? Whether you are looking to give your fireplace a contemporary or a dramatic look, there are no limits to stone fireplace design ideas. Search through our gallery or use your creativity and come up with some ideas of your own. The great thing about a fireplace is that you can change the way it looks at any time. Custom fireplaces can be designed from clients drawings or photographs. Every fireplace in the collection is characterized by the historical authenticity of its design and the outstanding quality of its craftsmanship and materials. Our experience allows us to provide you guidence through the process and requirements of choosing different styles, designs, applying various materials, color and texture. Carved Stone Creations carries the most extensive fireplace and mantel capabilities in the United States. We have the experience of hundreds of beautifully completed projects. We can design unique properties using 3D CAD drawings for each piece. This allows us to achieve ultimate accuracy in every detail. We provide our architect designers and clients all the resources necessary to achieve the best look and style. We think everyone deserves a beautiful fireplace so we work within all budgets to achieve stunning results. We will handle the entire process from custom designs to adding that final crowning signature piece. The right piece can define the ambiance of your room, and makes the selection important. Stone fireplaces emit beauty throughout the entire room. Our designs range from custom to both historic and contemporary designs. We handle everything from home to multi-commercial projects of any size and scale. Carved Stone can create any different style and design to meet clients interior design goals. Our work draws inspirations from ancient times or the latest modern trends. Carved Stone Creations’ expert designers will help you match any decor. 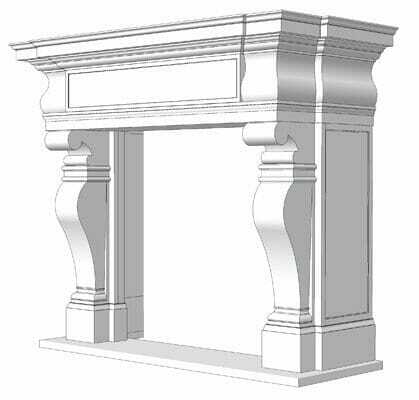 We have extensive knowledge in architectural and historical design which is essential in choosing the correct mantel for any interior. We are sure you will find a fireplace unique to your taste or desire. Our designs can be customized for any type of firebox. If you need help with sizing on an existing firebox or fireplace insert, give us a call. We would be more than happy to help you with design, scale and detail.